Partnering with Just Communities of Arkansas, The Greater Bentonville Area Chamber of Commerce has produced programming around Diversity, Equity and Inclusion. 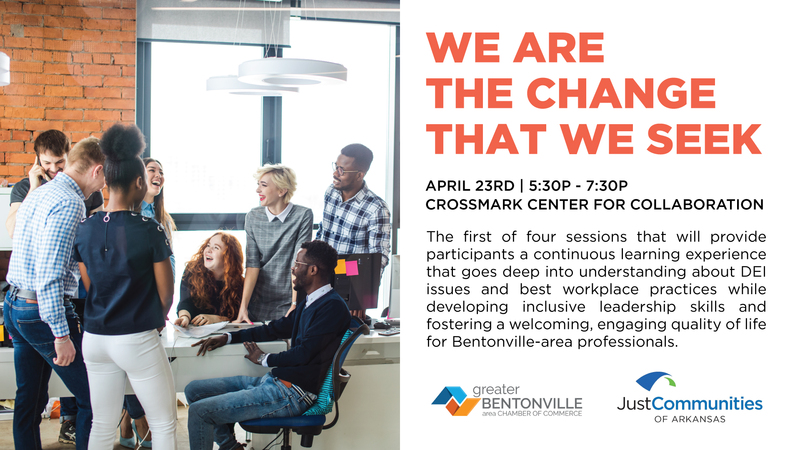 This innovative and trans-formative program is a key stone of the Chamber’s equity-driven economic growth and diverse talent initiatives and will provide participants a continuous learning experience that goes deep into understanding about DEI issues and best workplace practices while developing inclusive leadership skills and fostering a welcoming, engaging quality of life for Bentonville-area professionals. This session will be geared towards those leading our economy and community for the decades to come, so its set during the lunchtime hour. Although not required; we ask that participants make every effort to join all four sessions; form an organic cohort and build shared experiences to strengthen relationships and collective focus for future projects. Look forward to getting acquainted on a deeper level of self and acknowledging the light in others. If your organization is interested in sponsoring this event, please contact Sierra Polk for details. These sessions will be held from 11a -1p and will include a few minutes for networking before and after the work hour. Lunchtime food and beverages will be provided.